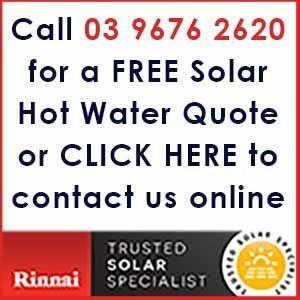 Although solar hot water systems have been around for decades new technology and government rebates have raised a lot of queries from our customers. Over the years we have answered thousands of those questions and as solar hot water specialists we make it our business to stay at the forefront of both the technical and legislative updates related to our industry. Below is a list of the answers we provide to the most popular questions we are asked on a daily basis by our clients. However if your particular question isn’t listed feel free to use the online contact form at the bottom of this page and we will reply to you personally as soon as possible. Does It Matter Which Direction My Solar Panels Face? Yes. Due North is the ideal direction for maximum performance of solar panels for hot water, however, where this orientation is not practical, collectors facing within 45° from North are acceptable, with a small reduction in efficiency of approximately 5%. Where panels will be facing either due East or due West, Victorian plumbing regulations require the system efficiency to be a minimum 70% to allow for the greater loss of efficiency. Where necessary, roof frames are available that allow for panels to be installed on virtually any roof direction, while re-orientating the panels towards North. The inclination of the solar collectors should also be considered, and ideally should be the same angle as the latitude of the installation location, i.e. Melbourne has a latitude of 38°, therefore the angle of the solar collectors should also be 38°, however a pitch within 20° of the optimum is acceptable, with only a small reduction in efficiency. All models in the Rinnai Solar range of solar hot water systems come with a choice of gas or electric boost heating. Each gas boosted solar hot water system utilises a solar specific version of Australia’s No. 1 selling continuous flow hot water system; the Rinnai Infinity. This combination offers the very highest efficiencies. Where reticulated gas supply is not available, all Rinnai Infinity’s have the option of being LPG (bottled gas) compatible. Where reticulated gas or LPG is not available, then there is the option of electric boosting on all models. Victoria’s plumbing regulations require a booster to be fitted with all solar systems, but it is usually only needed on days with low solar gain. Electric boosting operates on a thermostat and will maintains a minimum temperature of 60°C in the tank during off peak times of 11pm – 7am. On the other hand, a gas booster only operates on the solar tank outlet line and boosts only when the hot water is in use and only then if the temperature in the tank is less than 70°C as per Victorian plumbing regulations. All Rinnai Solar hot water systems have differing levels of frost protection. To check which system is right for you, please check your postcode against this list to determine which type of system is right for your area. If frost is an issue in your area, then a Rinnai evacuated tube system may need to be installed. These systems are rated to -12C. This system does not require frost dump valves which can waste huge volumes of water and are not long lasting, or the need for a glycol based anti-freeze system which are inefficient and require routine checking and maintenance. How Can I Claim My Government Rebates Including STCs and VEECs? With your purchase of a solar hot water system, you may be eligible for any one of several federal and state government rebates. Living Solar can do the work for you: we can claim the rebate/s you are eligible for on your behalf and provide you with a ‘point of sale’ discount on your hot water system to the value of these rebates, STCs or VEECs. This makes your initial purchase price much lower and also saves you the trouble of dealing with any government departments or facing delays in receiving your rebate cheque. Most solar hot water systems sold today are ‘split’ systems, which has the heaviest part of the system on the ground, with only the collector panels installed on the roof. The solar tank is not much different to install than a normal storage hot water system. If you have chosen a gas boosted solar hot water system, you can install the booster on the tank or on an adjacent wall. Most installations, including split and close-coupled systems, are installed in one day, so by the time you come home at night, you will have piping hot water ready to go. Can You Use Plastic Pipe Work With Rinnai Solar Installations? Plastic pipes must not be used between the storage tank and solar panels as these systems operate at very high temperatures and pressures. Insulated copper pipe must always be used with a solar panel for hot water. If a house is being plumbed with plastic pipes, it is recommended to contact the pipe manufacturer and obtain their specifications. The first metre of pipe from the solar tempering valve should always be insulated copper pipe. What About The 50°c Legislation To Bathrooms? As with any new home or major renovation, an approved 50°C tempering valve suitable for solar hot water systems will need to be fitted to all hot water lines leading to bathrooms. Can I Use Rinnai Infinity Water Controllers/Touch Pads With My Gas Booster? No. Government requirements say the booster temperature must be set at a minimum of 70°C and be non-adjustable.